Paeonia Bowl of Cream is one of our personal favourites. When we first saw this thick, beautifully white peony years ago, we were swept off our feet. 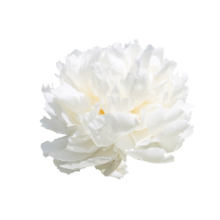 Since then, many new white peonies have appeared on the market, but in our opinion Bowl of Cream is still one of the very best. The full-petalled white coloured Bowl of Cream blooms in mid-season. Because of the huge flowers that look like big cups filled with whipped cream, the name is chosen very aptly. In addition to the huge flowers, our Bowl of Creams come with massive stems, they are sturdy and solid and perfectly able to carry the large flowers. We obtain “Bowls” from all over the world, making them available almost all year round. Carl G. Klehm registered Bowl of Cream in 1963 and was awarded the APS Gold Medal in 1981. It is the most important award given out by the prestigious American Peony Society. Firstly, always cut the stems of peonies diagonally before you put them in a vase with some lukewarm water. For the reason that they can use some extra energy add some flower food or sugar to it. Furthermore always try to keep the water fresh, peonies don’t like bacteria. Furthermore, keep peonies in the shade to maximaze the vaselife. Last but not least, enjoy!